Watch the video below to get a sense of what can be displayed at your event. Whatever your feed we can display it on one of our wall systems. With sizes to fit virtually every budget, this service can bring new meaning to interactivity and crowd participation. Whether it’s digital branding, signage, announcements, interactive social media or a live video feed from a camera you can get your audience involved. As the world of video technology progresses, the picture that these walls are capable of delivering gets better and better and it is our goal as a company to provide the latest and best. Our premier wall is a 6mm indoor/outdoor (IP65 rated and the only outdoor rated Hi-Def option in the market place) solution that will impress the most critical of videophiles rendering full HD resolutions in a unique and scalable form. Perfectly at home on-stage, off-stage, flown or ground stacked our system can be tailored to suit the needs of both you and/or your client/audience. Try a large center screen with custom sized monuments that give depth and dimension to any stage. Or go for the full rock concert look with two giant screens on either side of the MainStage making the overall size and feel of the show absolutely enormous! Additionally, our design team can help to customize and create 1-off content used for advertising, information, direction or any other reason where a displayed message is needed. 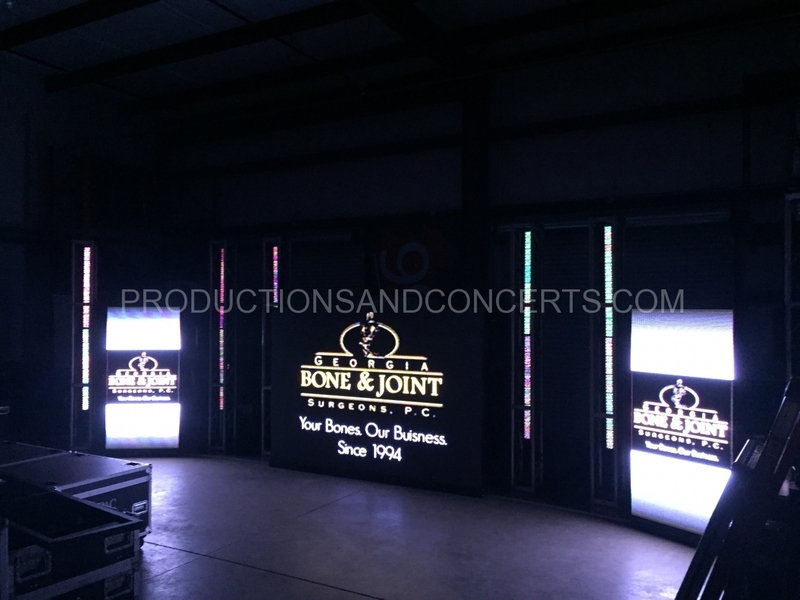 Here are a couple of additional photos of some of our LED wall setups too – click to start the slide show.